The Sierra Nevada is a unique region that provides water, electricity and natural resources that are essential to local residents and to the state of California. Sierra watersheds supply 60% of water used statewide, offer prime recreation, provide habitat for half the animal and plant species of the state, and generate 55% of California’s hydroelectric power. 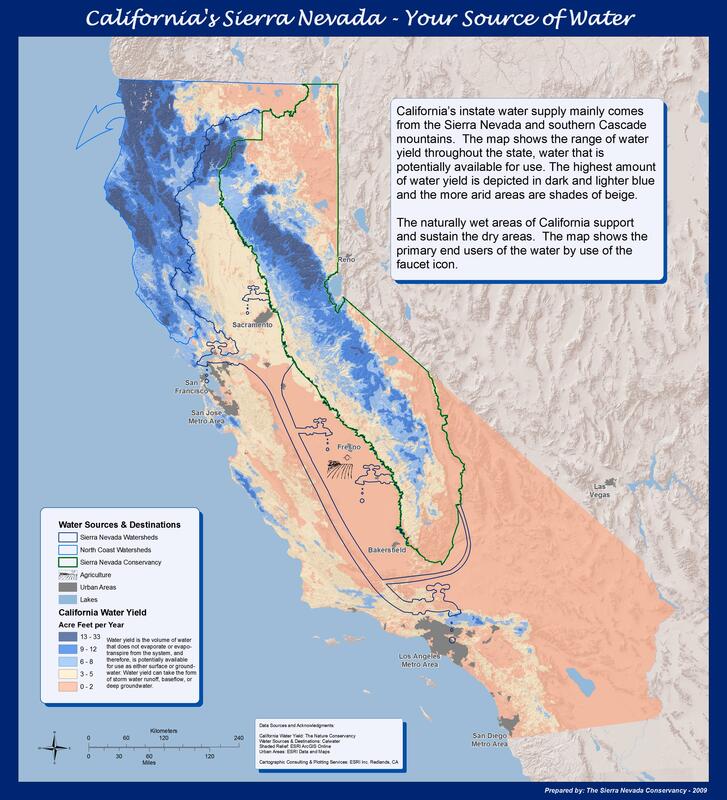 According to the Department of Water Resources (DWR), climate change is already impacting California’s water resources. DWR further expects that a 25% reduction in snowpack by the middle of the century will impact California’s water supply, while an increase in weather extremes to both larger winter flood events and more frequent droughts. Climate change and population growth will significantly impair water supply availability, reliability, quality, and ecosystem health in the Sierra and far beyond. This will necessitate a cooperative regional response and reinvestment in our watersheds and water resources by all beneficiaries. Failure to take action to address these impending threats will lead to the deterioration of natural processes, water infrastructure, and public safety, resulting in significant economic and ecological consequences for California and the nation. The Sierra Nevada Conservancy map above depicts the areas, which are sustained by Sierra watersheds. The Sierra Nevada supports a wide range of California plant and animal life - 17% of the plants, 21% of the animals and all of the aquatic species depend directly on the Sierr's rivers, lakes, streams, and riparian habitat for their immediate survival. (3) Riparian habitats are areas that are directly adjacent to streams, lakes and wetlands. 2. SNEP Report, vol. 2, Ch. 2, pp.29-30. 3. SNEP Report, vol. 1, Ch. 8, p. 129. 4. Sierra Business Council. 2007. The State of the Sierra. Sierra Business Council. Truckee, CA. pp. 15.